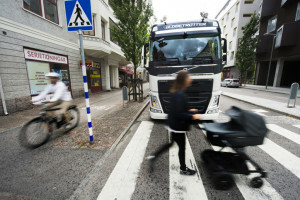 If Volvo has its way, truck accidents could be on the way out. The automaker is working on system for the haulers to help drivers avoid wrecks, aiming to combat low visibility as one of the primary causes of collisions. In order to keep an eye on things, the company is developing tech that continuously monitors surroundings with a 360-degree scan. A smattering of sensors, radar and cameras are placed around the truck to boost safety — especially in urban areas full of pedestrians and cyclists. Once the data is collected, the system interprets the details to communicate warnings, and it can even take control of steering and braking if the driving doesn’t respond in time. That all sounds quite good, until you hear that Volvo says the system won’t be market-ready for another 5-10 years. Non-Hit Car and Truck technology will be adopted by Volvo passenger cars by 2020. We will have to wait awhile to see if this is doable or not.